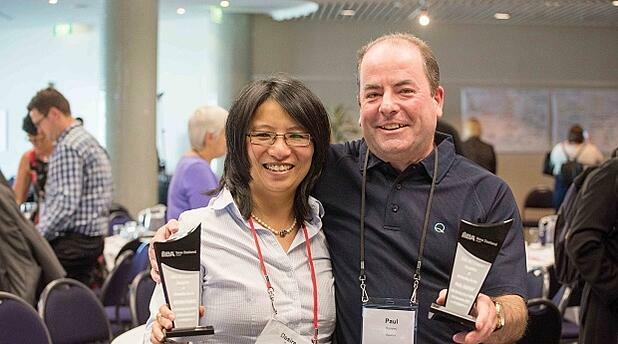 Equinox IT Director and Principal Consultant Paul Ramsay has been recognised by the New Zealand chapter of the International Institute of Business Analysis (IIBA®) who have presented him with an inaugural ‘Recognition of Outstanding Service’ award. The award was presented last Monday at the IIBA’s annual ‘BA Development Day’ conference. The award recognises Ramsay’s significant and ongoing involvement in the Institute since the chapter was founded in New Zealand in 2006. Equinox IT helped found the New Zealand chapter and Ramsay became its founding president, a role he held for two years. Ramsay has continued his involvement and contribution in the Institute since then, and was also a speaker at last week’s conference. In presenting the award current chapter president Andrew Willoughby said "Paul was instrumental in getting the New Zealand Chapter of IIBA up and running - the very first chapter outside of North America. Our first event held was hosted by Paul and there were hundreds of attendees. He subsequently incorporated our chapter and affiliated it with IIBA international. Our chapter has gone from strength to strength since then because of the platform Paul put in place. We wouldn't be here without him!" Equinox IT was the inaugural ‘Chapter Patron’ that funded the establishment of the New Zealand chapter and a number of people from the company are actively involved with the Institute’s Board of Directors and other groups and committees. During last week’s conference Equinox IT had four presenters, including Ramsay, sharing practical business analysis knowledge on becoming a master business analyst and specification by example. Also recognised by the IIBA with a ‘Recognition of Outstanding Service’ award was FMG Insurance’s Desiree Purvis. IIBA® is a registered trademark owned by International Institute of Business Analysis. Equinox IT is New Zealand’s leading independent IT consultancy, delivering software development, consulting and training services. Established in 1995, we inject fresh thinking to solve tough business problems. Equinox IT has over 60 staff based in Wellington and Auckland. The IIBA is the independent non-profit professional association serving the growing field of Business Analysis. The New Zealand Chapter is the representative for the IIBA within New Zealand. The chapter is nationwide with 'events committees' in Wellington, Christchurch and Auckland. Find out more about the IIBA New Zealand chapter.